75587RB is rated 5.0 out of 5 by 14. Rated 5 out of 5 by charlie47 from Love it Had older one, which I liked, but it got damaged during a bath remodel; replaced with this one; the 2.5gpm flow is the same so there is no reduction in flow, was afraid that if I went to the 1.5gpm I wouldn't like it. No problems so far and am sure Delta will back it. Rated 5 out of 5 by Parnelli25 from Works great Nice shower head. Works as advertised. Rated 5 out of 5 by Bvstp from Really like it Had a Delta before that we loved, then a well pump issue happens and it became clogged with minerals. So I ordered a new one online that looked nice ( not a Delta) and it was horrible. Sent it back, went to Lowe’s and got lthis one. It’s like having my old one back with that good water pressure and newer style. 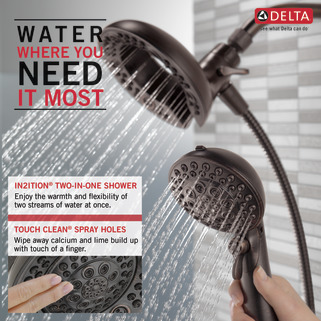 Like the all in one had held with the shower head. it feels solid and heavier than the one I had ordered. Just better quality overall. I recommend Delta! Rated 5 out of 5 by Bigman518 from Great This is the best hand/shower head I have ever purchased. i highly recommend this product. Rated 5 out of 5 by MattGZat from Great Product, Design and Price The 2-1-1 (use showerhead with handshower-use only showerhead-use only handshower) design is why I own it. Pluses are the warranty, the manufacturer, the mainly durable plastic construction, and the ease of installation. Further, customer service - if there is a question, problem or repair part request - there is easy access and customer friendly staff. Rated 5 out of 5 by Kev56 from Solid yet sleek design. Easy to install and very nice appearance. 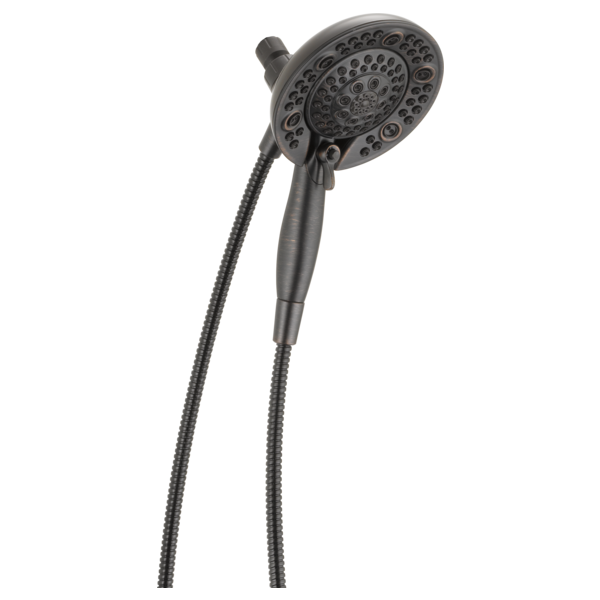 The sturdy main head allows smooth removal of the handheld spray head. Adequate hose length that has nice structure that doesn't twist around like the cheaper models. Really like that the large head can maintain spray while I remove the handheld. Upper connection flow control is super easy to change water flow settings. Separate water flow selection lever on the handheld spray. Even the packaging was well thought, as each end of the hose had wraps to keep the seals where they belonged. Hand tightening was all I needed to do. Well worth the extra $18 in cost compared to cheaper and less feature products. Only non 5-star is that the massage spray is not as hard as my older single head Water-Pik. Rated 5 out of 5 by swede1 from Product has great options. We bought one of these in2ition shower units about 4 years ago until the switch on the head got so tough to turn it broke off. I returned it to the store and they gave me a new one. Unfortunately the switch only lasted less than a year. I decided to get the new one I have now, and will wait to see it it fails. I hope not as I love the shower unit. We have good water quality, so I have no idea why these switches failed. 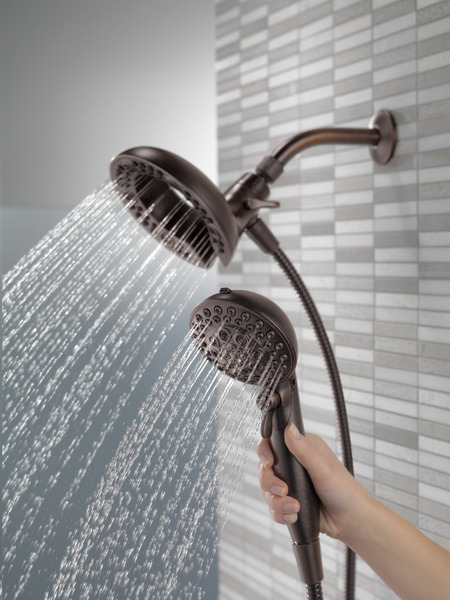 Does the showerhead still put out water if using just the handheld? 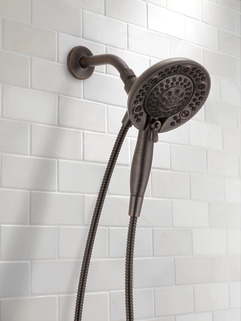 I seem to have lost the part that connects the shower head to the shower arm,is this part available? Is spray attached by a magnet? Does the hand spray come off and got back through a magnet or do you have to clip it in somehow? Is this model metal, plastic, or a combination of both? Also do you have any all metal models? Is this a new version? What is metal and what is plastic? This item number seems different from others I have seen online at other sites. I am wondering how sturdy this is. I have searched many of your different models and some seem to be more reliable than others. I need the handheld and a shower head. Is this the most reliable Delta model in nickel finish? Is there another one that has the in2ition feature? does pause button control both the shower head and the handshower? I need to be able to control the shower head flow from a seated position. Can this be done with any of the in2ition heads? Does the shower head rotate on the ball joint or is it fixed? Yes, the fixed part (horseshoe shape) rotates. 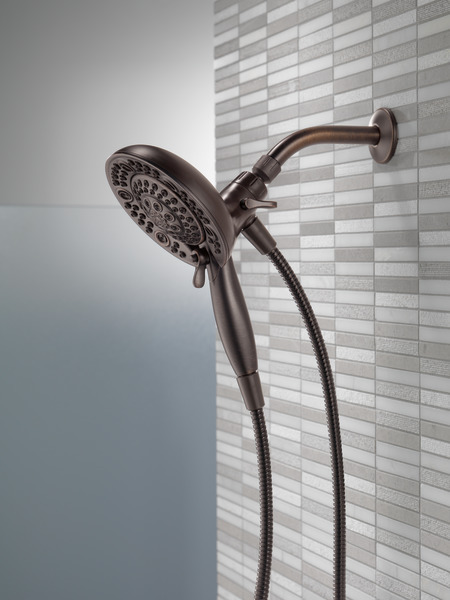 Can you tell me which faucet goes with this model 75587?